At All Canadian Renovations, we are committed to making the home renovation process as easy as possible on you – our client. From the initial consultation to project completion, we work with you every step of the way to ensure that you get exactly what you want from the renovation. We work with many of Manitoba’s top architects, designers, developers and engineers and specialize in bringing your dream to reality. Whether it is a bathroom, kitchen, rec-room or addition, we assist our customers through all decisions. From design and colour to cabinetry and tile, we will ensure that the final result reflects our clients’ vision. All Canadian Renovations endeavors to remove the hassle that is involved in a self-managed renovation. 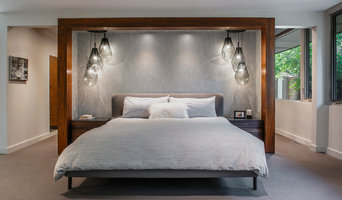 We employ our own designer, carpenters, plumbers and electricians so our clients deal only with their renovation consultant, which removes the stress of communicating with a number of different individuals. Our hassle-free renovations result in the utmost customer satisfaction. Since 1983, Gateway Kitchen & Bath has been known for quality renovations and premium custom cabinetry. Our innovative designs, project management and precision construction methods used by our woodworking specialists, always result in exceptional interior environments. Please visit our showroom to speak with one of our designers and view a broad range of products for your new home or renovation. We believe there is legitimate shift in today’s thinking when it comes to building. Many of you are now finding ways to do your part by THINKING before ACTING. And have come to us to REUSE a beautiful old tree from their own yard that had to come down because of unfortunate circumstances, with a vision of building something new from a piece of history. See how we can help you bring your thoughtful idea into a reality. Wood Anchor is a custom fabrication design-build studio specializing in handcrafted wood furniture, wood furnishings & wood art for residential, commercial & architectural design applications. 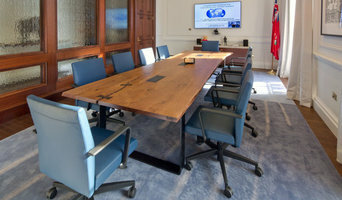 WOOD ANCHOR PRODUCTS AND SERVICES CUSTOM HARDWOOD TABLES - We design unique one of a kind conference tables that make a statement in any room. Perfect for your dining room boardroom, grand entrance foyers, boutique hotels, & boutique restaurants. Whatever your imagination brings to the “table” we can help you design you custom keep-sake from a simple idea to fruition. CUSTOM FABRICATION & DESIGN-BUILD - Wood Anchor offers full custom fabrication/manufacturing and design-build all types of architectural & interior design mill work for residential and commercial applications! CUSTOM SAWMILL SERVICES - We offer custom milling and shop services ranging from planing to sanding finishes. We can saw logs and timbers for your next project! Wood Anchor utilizes reclaimed and locally harvested lumber in each of its unique builds and products. With sources that include old timbers from historical buildings, trees cut down by the City of Winnipeg due to Dutch Elm Disease (DED), and other species of trees cut down due to development or farmland. Currently Wood Anchor is the only reclaimed wood company in North America specializing in Landfill Diverted Elm. What is it that defines Wood Anchor and separates us from the rest? Do we work harder? Do we care more? Our belief is that we take it a step further! Our passion allows us to see BEYOND the masses and dive deeper into what is readily available. Without sacrificing what is so vital to Mother Earth’s eco system. What makes us different from all the other builders and renovation companies out there is our standards of excellence in home renovation. We work with some of the best architects and have award winning designers on staff to build and renovate homes for people who want the best. People who value the expertise it takes to create a home or cottage where they can truly live their life. Single, married, young children, teens, retired – each stage of your life demands a space unique in function and form. We get that and we deliver that. We strive to understand, first who you are; and second, what your lifestyle demands. Then we create beautiful, functional homes through inspired design and construction excellence. We follow our own unique business model that ensures we do everything with our own staff, eliminating the scheduling issues that can come with using other sub trades. We take pride in our reputation for quality craftsmanship and as we build your dreams we build your trust. For over 30 years this has afforded us referral after referral . . . and that is what makes us different. We build beautiful kitchens for wonderful people. We work with leading suppliers of cabinetry, stone, flooring and fixtures. Our business is about connecting with people and we love it! Each customer is unique, each project is unique. Whether your focus is family, entertaining or both, we work with you to design a kitchen that reflects your vision for what the heart of your home should be. We will make your new kitchen build as easy as possible and will manage your whole project from design to dishwasher. TENTEN Kitchens & Contracting is run by Al Keith and Barb Hansford. Al looks after the overall operation and hands on installation. Most days, you will find Al working with tools and managing work done by our carefully selected team of sub-contractors. We wouldn’t be able to do the work we do without licensed electricians, plumbers, painters and other specialty trades people. Al’s job is to find great people and bring out the best work from everybody resulting in a high level of build quality. The first person most of our customers meet is Barb Hansford. Barb looks after design, sales and logistics. Her days see her busy meeting with customers and suppliers. She is also the one who manages the schedule and keeps everybody on track. Barb’s work brings great design and effective management. 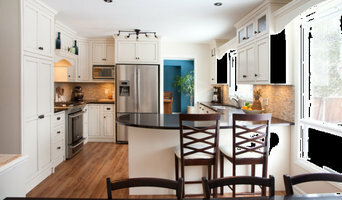 TENTEN Kitchens & Contracting specializes in interior renovations. Need a wall removed? Need a kitchen moved into another space? Want to reconfigure an entire floor? Give us a shout! We'd love to build you a beautiful space! Charisma, the design experience, an interior design firm established in 1986, provides complete interior design services to commercial and residential clients. At Charisma, we believe "an effective living space enhances your lifestyle, soothes the spirit and delights the eye"! The most successful way to do this is to enter into a partnership with our clients to help them reach their design goals. With the extensive experience we have acquired in working on a large variety of projects and by really listening to our clients, we create environments that are functional and aesthetically pleasing. Each client is unique and their interior must be an extension of their personality, not ours! Kim Schroeder, the principal designer who heads up the design team at Charisma, graduated from the University of Manitoba, Faculty of Architecture with the gold medal in Interior Design. In 1986, Ms. Schroeder established Charisma with the vision to make "good design" more accessible to the average consumer. As a result, Charisma has earned a reputation for professionalism, creativity and accessibility. 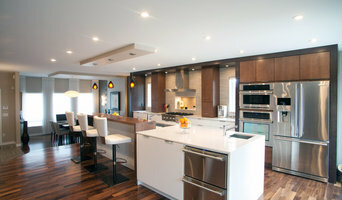 Jake Klassen's Kitchen Gallery designs, manufactures and installs, custom cabinetry while managing projects from conception through to completion. At the Kitchen Gallery, our strong design, manufacturing and installation teams work together to orchestrate entire projects. This means working in partnership with our clients to create personally customized spaces and then coordinating the tradespeople to keep the process as uncomplicated as possible. Our manufacturing team is comprised of journeymen craftspeople whose reputations and professional certifications are exemplified in the creation of Kitchen Gallery cabinetry and millwork. This professionalism is experienced not only in the quality of workmanship but also in the care involved in the installation process. Design-meets-function has always been For Space Sake's vision. To complement the ORG line, I am also a dealer for EcoSmart from Australia (ventless fireplaces), Komandor from Poland (sliding glass closet and room divider doors), and Clei from Italy (transformable furniture). This wide variety of options helps our customers enhance their existing spaces. We travel to New York once a year and avidly read and research design magazines for inspiration. We are never content with good - or even great - but constantly strive for excellence. Our greatest compliment is when a customer exclaims, "I absolutely love this store!" Happily, we hear that frequently. Even our music is especially selected to create a relaxing atmosphere. Customers have often told us they come into our store to relax, so I guess we are achieving our goal! At the present time, For Space Sake, has a designer, four installers, an Operations Manager, a Store Manager, and two store staff members to serve the greater Winnipeg area. We also go out to some of the outskirts, including the exclusive Lake of the Woods cottage property in Kenora, Ontario. We have shipped ORG as far west as Vancouver, British Columbia. By appointment only! Nu-Life Kitchens is a locally owned business started in 2007 by Mark Bjornson and Sheri Anderson. The company has grown from a basic cabinet refacing company to a full service renovation company offering cabinet refacing products and services, countertops, tile backsplash, renovations such as wall removal, painting, flooring installation, plumbing and electrical services. Since 2010, we have offered our clients our 800 square foot showroom where door colors and styles, countertops, and handles can be viewed and where we can help you pull your project together. Our company employs 6 office staff, 4 cabinet refacing installers and a number trades to bring Nu-Life to your kitchen. We pride ourselves on professionalism, customer service and co-ordination of projects. This year we have introduced NaturaStone Quartz to the Winnipeg market and it will be fabricated locally in Winnipeg by Nu-Life Kitchens. NaturaStone Quartz is a low maintenance countertop that is stain and moisture resistant. It is also a budget-friendly quartz that combines well with our cabinet refacing products. In 2017, we will be celebrating our 10th year anniversary of bringing Nu-Life to kitchens of Winnipeg and the surrounding area. _____________ Cabinet Refacing by Nu-Life Kitchens is an excellent alternative to replacing your entire kitchen. It can save you time and money while giving your kitchen a new modern look. Here are a few benefits of Cabinet Refacing: - Saves you money - The cost of Refacing is up to 50% less than a new kitchen - Shorter installation time - An average installation takes only 3 or 4 days - Modernizes your kitchen with new color, door style and concealed hinges - Refacing increases the value of your home - Cabinet refacing is an environmental friendly option as the existing boxes of the cabinets are saved. Lawn 'N' Order Landscape prides itself in providing its clients with innovative designs, premium products and quality installations. As with anything built, the foundation is the most important but so often the emphasis is on the final picture. If you want your pavers or landscape to give you years and years of trouble free enjoyment then the foundation is something that can only be done right once. We make sure we double industry standards for base for any paving stones we install as recommended by all quality installers around the world because of our clay soils. Once base is tested for proper compaction then we finish the job with Premium Borgert Pavers and pave edge restraints. Borgert paving stones have a lifetime warranty because they are made with granite as opposed to limestone to offer more strength and greater colour varieties. Also because they are made with granite they resist any ice melt products you may apply which is not the case with other pavers. Quality hardscapes is just the beginning! All softscapes use premium plantings,composted soils to eliminate weed seedsin the soils used for beds and turf. Landscaping if done right will give you years of enjoyment! It is the biggestroom of your home, so why not do it right! We will not cut corners as we want to stand behind all of our work for years to come. We can handle any size project and will do so with the integrity and passion that has made so many customers refer their friends to us. We will take you from conceptual drawings to final design and construction keeping you involved throughout entire process. We appreciate you considering our company to create your dream landscape and look forward to being a part of that dream! At Hawthorne Kitchens we take great pride in our fourth generation family business, as one of the most experienced kitchen cabinet shops in Manitoba. We specialize in custom cabinets, complete design and complete renovation services.Anyone can provide you with the basic essentials of a kitchen, but trust the company that has been in business since 1946 to go the extra mile to give you the kitchen of your dreams! We have provided beautiful kitchens and woodwork throughout Manitoba, Ontario, and North Dakota. For a FREE in home consultation contact us and we would be more than happy to speak with you! But before you start sending out dozens of emails and making phone calls, sit down and think about your project. What's your budget? What is the scope of your project? Will you need more than one type of professional to complete your home improvement project in Winnipeg, MB? Can you afford to complete the full project now, or should you tackle it bit by bit? Once you've settled on your project’s priorities, budget and scope, it's time to start researching Winnipeg, MB home design professionals. Don't sell yourself short and settle on the first professional you set your sights on. Make sure that you're working with someone local, who can get to the jobsite easily and efficiently. Look into the person’s reviews, ask to speak with former clients and to see previous jobs in person. Take a good look at their portfolio photos: How similar are these projects to your own? Be honest — that mansion might look beautiful, but it might not have a lot in common with your little bungalow. Reach out to multiple professionals — especially for larger projects — and don't settle for the first bid you hear. Comparing multiple Winnipeg, MB professionals' bids and experiences can help you find the one that’s best for you. Ask a lot of questions now, so you won't have unexpected answers later. Find a home design professional on Houzz. Narrow down your search by type of professional and location. 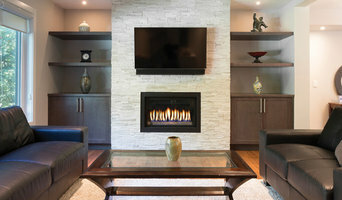 Browse Winnipeg, MB portfolio photos, read client reviews and contact each Winnipeg, MB professional for more information. Check out the information in the specialized professional sections too for tips on how to hire the right professional for your project.